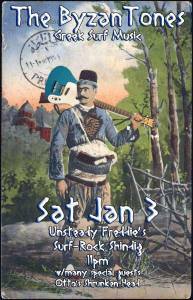 This SATURDAY NIGHT Jan 24 2015 (9 PM to midnight… more or less) come to Greenpoint, Brooklyn’s swingin’est bar TROOST to partake of the musical mind-bending experience that is DJ BARBA YIORGI selecting amazing tracks from a treasure trove of Afro-Balkan Psychedelic Groove and World Music Soul Rarities…. All danceable – Some even maybe sung in human languages! Anadolu-Gypsy-Latin-Sahelian-Congolese-Greek-American-Garage Rock-Electro Funk and more! This SATURDAY NIGHT! Will 2015 be the year THE BYZAN TONES conquer the world? ?– OR will it be MERELY a milestone in musical history – starting with GREEK SURF-ROCK PSYCHEDELIC MADNESS returning triumphantly to New York City’s OTTO’S SHRUNKEN HEAD to celebrate UNSTEADY FREDDIE’S BIRTHDAY SURF-ROCK EXTRAVAGANZA!! The secret cult of musician-mystics known to you as The ByzanTones… have been completing a long-awaited debut album BYZAN-TONE EMPIRE… a melange of original melodies inspired by exotic music such as the Greek Gangsta Blues that the ByzanTones perform in their acoustic manifestation as DERVISI. Annabouboula continues to follow the melismatic perambulations of those Bad Boys of neo-Rembetica, The Byzan-Tones’ acoustic spin-off act DERVISI. Their next outing will be TONIGHT (Thursday May 15) at the cozy coffee bar Espresso 77 located at35-57 77th Street (just off of 37th Avenue) (74th-Broadway stop on the 7 train) in Jackson Heights, Queens. DERVISI are REPRESENTING the spirit of Old Piraeus with a style they call Punk Rembetic. They are George Barba Yiorgi on tzura, guitar and vocals, Stelios “SpitiPethi” (Homeboy Steve) Antonakos on guitar and Thanassi Donaldson on baghlama and percussion. Barba Yiorgi is a co-founder/musical director of Annabouboula; Thanassi (aka Ethan) D. played drums and engineered crucial tracks on the last Annabouboula release “Greek Fire”; and Homeboy Stelio, (apart from his parallel life as an in-demand American roots-rock guitarist/songwriter) spent many years performing with New York City’s premiere Greek party band, Magges (a band inspired by the legendary Trio Bel Canto). A frequent guest performer with DERVISI is longtime Annabouboula collaborator, clarinetist Big George Stathos… We’ll be updating you with their latest exploits as they try to evade Officer Bairaktaris and other party-poopers, in their quest for Peace, Love, Odd meters and fragrant herbal remedies.